Bull Run keeps chugging along, attracting buyers with "new" and "like new" homes in the high demand 32312 zip code in Northeast Tallahassee. Money remains cheap (low mortgage interest rates) and buyers are using their enhanced spending power to get the features and amenities that one finds in a home built within the past few years. Many of them are drawn to homes being built today, but it's the fact that the homes are all relatively new and in a prime location that keeps Bull Run's home selling momentum charging forward. 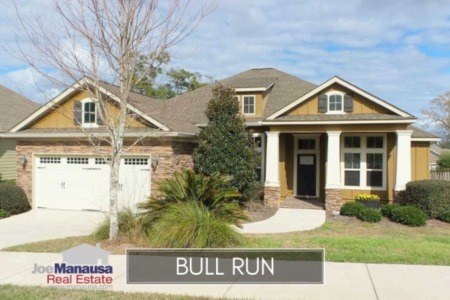 So if you are thinking about moving to Northeast Tallahassee and you want a newer home, consider looking at one of the seventeen homes for sale in Bull Run right now. 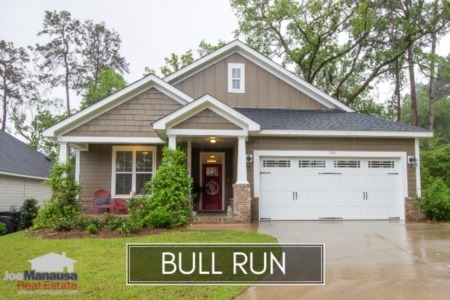 In this report, we will look at prices, values, and sizes of homes in Bull Run, as well as show current listings in the Tallahassee MLS and all closed home sales going back to 2005. It is important to note that the narrative contained below is for sales through December for all previous years, but through the middle of September in 2015. The graphs and the closed sales table will be continuously updated into the future (meaning bookmark this page if you always want to know the current status of homes in Bull Run). Average home prices have risen a little more than 1% thus far in 2015, as smaller homes bring smaller prices in this highly active community. Prices still sit well below the peak of the market prices established in 2007, but they have been on a slow rise for the past four years running. Distressed sales are are occurring at a rate far lower than other neighborhoods in Tallahassee are seeing, mostly due to the fact that a hearty portion of the sales are new home construction. The average recorded sales price is $316K for Bull Run through the third week of September in 2015. Home sales activity last year was record setting as there were 68 closed home sales in Bull Run and the pace has not slowed much in 2015. There have been 49 closed home sales and the current rate of sales suggests that 2015 will fall just slightly behind last-year's record setting pace. Bull Run home values have risen 6% when compared to last year's average, the third year in a row to see appreciation since the low set back in 2012. So while prices have only moved a percent higher, home values have actually moved 6%. This is why we look at values (not prices) to estimate real estate appreciation. Of course, we would also need to remove the new homes to truly track appreciation. Through the third week of September, the average value of a home sold in Bull Run has been $151 per square foot. This is up 6% over last year and 14% above the bottom reached in 2012, which is only 6% lower than the market high set back in 2007. With such a high proportion of these being new construction, we know that the average is skewed higher because of these new homes. Unfortunately, like everywhere else in town, this means that many homeowners who have purchased or refinanced in the past 10 years should expect lower prices and values, and they likely have little or negative equity in their homes. The average home size sold in Bull Run typically falls in a range of 2,000 to 2,300 square feet, and this year buyers have been selecting the smaller homes. The 49 sales thus far in 2015 have averaged 2,085 square feet, which is part of the trend of building the newer homes smaller to keep the prices down. The following list shows home sales going back to 2005 in Bull Run, the first year that homes began selling there. I hope you enjoyed our September 2015 update on home sales in Bull Run, please feel free to drop me a note if you have questions not covered in this report. Do Fewer Listings Make It Easier To Buy A Home Right Now?